The newly-written subplot of my novel, Finding Home, underscores the mistreatment of the Home Children and the suspicion with which they were viewed. 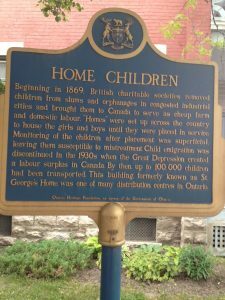 The earliest child immigrants were brought to Canada in 1869 by Annie Macpherson, who predated the better-known Dr. Thomas Barnardo. It used to shameful to admit having a Home Child in the family tree. Now, as with those descended from the convicts sent to Australia, it has become a source of pride.